In what is billed as a confirmation of an earlier experiment by Italian priest-physicist Don Carlo Borghi, which remained largely ignored by scientists, Ruggero Maria Santilli has demonstrated a simple method of synthesizing neutrons from the protons and electrons contained in gaseous hydrogen. 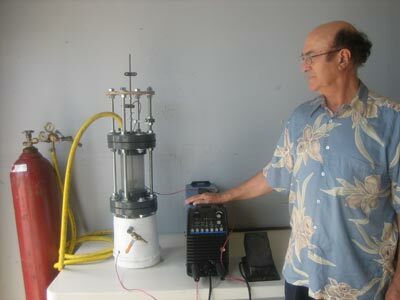 The experiment was performed at Santilli's Institute for Basic Research in Palm Harbor, Florida. The abstract and a pdf version of a first account of the experiment are available at arxiv.org. "Following Rutherford's 1920 historical hypothesis of the neutron as a compressed hydrogen atom in the core of stars, the laboratory synthesis of the neutron from protons and electrons was claimed in late 1960 by the Italian priest-physicist Don Carlo Borghi and his associates via a metal chamber containing a partially ionized hydrogen gas at a fraction of 1 bar pressure traversed by an electric arc with 5 J energy and microwaves with 1010 s-1 frequency. The experiment remained unverified for decades due to the lack of theoretical understanding of the results. In this note we report various measurements showing that, under certain conditions, electric arcs within a hydrogen gas produce neutral, hadron-size entities that are absorbed by stable nuclei and subsequently result in the release of detectable neutrons, thus confirming Don Borghi's experiment. The possibility that said entities are neutrons is discussed jointly with other alternatives. Due to their simplicity, a primary scope of this note is to stimulate the independent re-run of the tests as conducted or in suitable alternative forms." Santilli had previously contacted physics labs in the USA, Europe, Russia and China asking them to test the possibility of a synthesis of neutrons from protons and electrons, but had been consistently rejected. Hence the experiment, which is extremely simple and can be repeated by practically any reasonably well equipped researcher, was performed at the Florida laboratory of Santilli's Institute for Basic Research. The theory is that alignment around the magnetic force line axis of a DC electric arc allows protons and electrons to fuse, forming a hadronic particle, most likely a neutron. - The particles produced by the experiment may represent a new bound state of protons and electrons at short distances, a particle tentatively named an arcogen, meaning generated by the action of an electric arc. - The experiment may have led to direct synthesis of a neutron and a neutrino by the fusion of a proton and an electron with some of the needed energy supplied by the electric arc. - There is a real possibility that should not be discounted that some of the needed energy is actually supplied by the universal substratum of energy, which is the aether. This would point towards a possible mechanism for the continuous creation of matter in cosmological terms. Summing up, Santilli hints at the exciting possibilities his experiment holds for the future of physics. "All in all, rather than having reached the end of knowledge with quantum mechanics, research in the synthesis and structure of the neutron may stimulate a new scientific renaissance with theoretical experimental and industrial advances perhaps beyond our imagination at this writing." A more detailed presentation including photos of experimental set-up and print-outs of neutron detection recordings. Palm Harbor, FL 34684, U.S.A.
Can MagneGas Cleanly Serve World's Energy Needs? Prof. Santilli is the world leader in the study of lightning and thunder, because he spent several years of research on new processes caused by lightning at the particle, nuclear and molecular levels (patented and international patents pending). These studies were initiated under DOE support while Prof. Santilli was at Harvard University in the late 1970's, and required a structural generalization of quantum mechanics into a new discipline today known as hadronic mechanics. The construction of the new hadronic mechanics became necessary because lighting causes contact nonpotential interactions among extended constituents (such as nuclei, atoms or molecules), which interactions are beyond any dream of serious treatment via quantum mechanics (since the latter mechanics can only represent point particles that, as such, cannot have contact interactions). In particular, a quantitative representation of thunder had remained un-achievable since the birth of science, because the small sectional area of lightning and its extremely short duration (of the order of nanoseconds) do not permit a credible achievement of the huge energy needed by thunder via conventional chemical processes. Prof. Santilli recalled that, one hundred millions year ago, our planet only had 40% nitrogen (as proved via air trapped in amber), that the nitrogen percentage in our atmosphere increased gradually, and that lightning is the only possible mechanism on Earth capable of slowly synthesizing nitrogen N(14,7) from carbon C(12. 6) and deuterium D(2,1), by instantaneously releasing all the energy needed to represent thunder (patented and international patents pending).